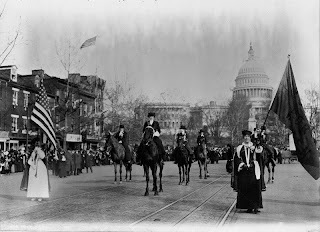 Last week was the 90th anniversary of the 19th Amendment to the Constitution being ratified. It had been proposed in June of 1919, but was not ratified until August 18th, 1920. Women had been struggling for the Right to Vote for decades, usually citing the 14th Amendment, one of the so-called “Reconstruction Amendments”, as the legal basis for that right. The 13th, 14th and 15th Amendments were all proposed and ratified between 1865 and 1870. They were the first Amendments to the Constitution in over 60 years, the last Amendments having been ratified in 1804 to clarify the limits of Judicial Powers and the manner in which the electoral process was to operate in choosing the President. In the days following the Civil War women across America had begun to agitate for the Right to Vote, some arguing that since African –Americans were now equal, women should be granted at least the same rights as those who had so recently been disenfranchised. This was a losing argument. The Constitution itself limited the Right to Vote to free men only, and later, after the Civil War, in the 15th Ammendment, to all men regardless of race or servitude. When Susan B. Anthony began her struggles to acquire the vote for women, it usually took the form of a challenge to the 14th Amendment with it’s broader scope of “Citizenship Rights Not to be Abridged.” The fallacy of this approach was that the 14th Amendment was very clear in it’s definition of who could vote. Men, 21 years or older and even then only if they had not taken part in an insurrection, or rebellion, against the United States, were allowed to vote. The “Reconstruction Amendments”, under which so many of our present day rights have been granted, were all ratified at a time when Congress, and the Senate, were in a state of turmoil and confusion following the Civil War. The 14th Amendment, in particular, has always lived in the shadow of whether or not it was even properly ratified. Although ratified by the Senate on July 9th, 1866, it was not declared the law of the land until July of 1868, when the Secretary of State proclaimed that it was, indeed, ratified. "It is true that many women are unmarried and not affected by any of the duties, complications, and incapacities arising out of the married state, but these are exceptions to the general rule. The paramount destiny and mission of women are to fulfill the noble and benign offices of wife and mother. This is the law of the Creator. And the rules of civil society must be adapted to the general constitution of things, and cannot be based upon exceptional cases. " I’ll run that by my wife and let you know how it turns out. But my point is that they were barking up the wrong tree. Clearly, there needed to be an Amendment that directly addressed the question of whether or not women were fully citizens of this country. It was to be a long haul. Between the 1870’s and 1920, when the 19th Amendment was ratified, there were scores of attempts by women to vote. 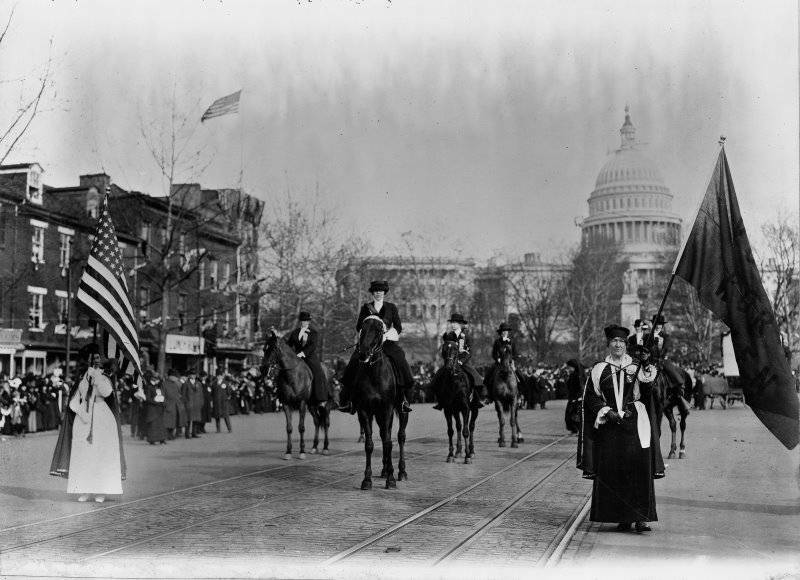 The movement, known as the Women’s Suffrage Movement, had run several candidates for president, all to no avail. After World War One had ended, and women had proved their worth once again in a time of national strife, there was an increased call to right this wrong. And this time they were successful in their quest for the Right to Vote. As a matter of fact, during the final years of President Wilson’s second term in office (1916-1920), his affairs were largely handled by his wife Edith. It was she who had made the trips across the Atlantic in furtherance of President Wilson’s goal to establish the League of Nations. It can be successfully argued, that in the absence of her husbands ability to function fully after his stroke, Edith Wilson was the first woman to administer the affairs of the office of the President of the United States. And so it was, that in 1920, women gained the Right to Vote. I remember growing up in the 1950’s and 60’s and the lack of women in every major field. There were no women police officers, letter carriers, cab drivers etc. It was a man’s world. Women were generally relagated to jobs such as teachers, librarians, nurses, cleaning and other mundane tasks that men were not interested in. I also remember the ridicule heaped upon women in 1960 when they went nuts over a handsome candidate from Massachusetts, John Kennedy. It was joked that women were voting for President based on looks alone. Now fast forward to the world of today. We have women in Congress and the Senate, there are women Governors, there are women in outer space and we have even had our first serious woman contestant for President of the United States. There are still areas in which women have not attained true equality, but the 19th Amendment was a big step towards that end.